Introducing Raf Simons’ highly anticipated debut of CALVIN KLEIN 205W39NYC eyewear, which uniquely highlights the new Chief Creative Officer’s artistic and curatorial perspective of the brand. 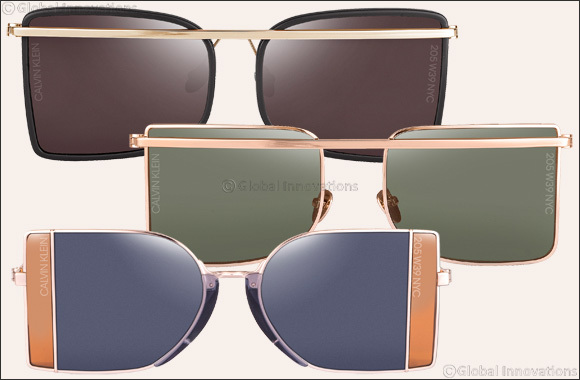 The new CALVIN KLEIN 205W39NYC eyewear collection features architectural silhouettes rendered with sleek, metal details in bold color combinations. These statement pieces are artfully conceived by combining delicate materials and finishes with negative space and color blocking. Each of the unique new styles is designed in the company’s global headquarters at 205 W 39 Street in New York City and made in Italy. CK8057S. Rectangular in shape, these sunglasses feature Art Deco inspired, dual-colored contrasting lenses and vertical 205W39NYC logo. The open metal detail at the temple and signature barrel hinge create a modern, architectural look. Available in gray/green, rose/deep gray, blue/amber and burgundy/light gray. gold/green, polished silver/burgundy and polished silver/amber. CK8578S. A sleek, unisex style fronted by a metal brim that wraps to an open, metal temple detail with signature barrel hinge and titanium nose pads. The flat lenses are finished with dual vertical logos and framed in plastic. Available in polished gold/black, polished gold/camel, polished silver/white and polished silver/burgundy.